Spain is one of the largest countries in Europe. 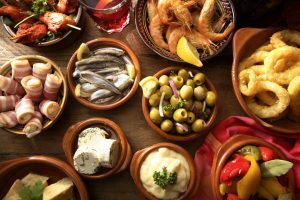 The residents of Spain belong to a number of different ethnic groups and Spanish cuisine is as diverse as its population. If you think that all you will find in Spain is heavy, medieval-style food, you will be very surprised. Spain is surrounded by water almost on all sides, which is why fresh seafood plays a very large role in Spanish cuisine and diet. However, meat also plays an important role in the cuisine of the country. Spaniards especially love cured hams and roasted meats. Because of its climate, Spain also has lots of fresh fruits and vegetables. If you are a vegetarian, finding great food in Spain will be really easy for you. Dining in Spain, be it at home or at an upscale restaurant, is an important social event and time to relax. Most Europeans and Americans find dinner time in Spain to be ridiculously late. Lunch is considered to be the main meal of the day and you will often find inexpensive price-fix lunch menus at a lot of restaurants. Such menus would usually include a choice of an appetizer, bread, main course, dessert, and water or wine. PreviousPrevious post: Why Visit Spain?